Hopefully many of you will have seen that we’ve just announced the much anticipated next title from Quantic Dream, the makers of Heavy Rain. BEYOND: Two Souls is an interactive psychological action thriller starring Oscar nominee Ellen Page (Inception, Juno) in the lead role of Jodie Holmes. Yes, I know, Ellen Page — pretty awesome! Ever since she was born, Jodie has always been different from everyone else. She possesses supernatural powers through her psychic link to an invisible entity she calls Aiden, and this gift has changed her life forever. In BEYOND: Two Souls you will experience the most striking moments of Jodie’s life as your actions and decisions determine her fate. You’ll also be able to take full control of both Jodie and the entity in spectacular action and adventure scenes. And as Jodie traverses the globe, you will face incredible challenges in emotionally charged events never before seen in a video game. BEYOND: Two Souls also features a brand-new game engine and will be one of the best-looking games ever seen on a PS3. Don’t take my word for it, watch our E3 trailer above! We’ll have lots more to come in the coming weeks and months, so do stay in touch. Cant wait for this game either. Now i have to go back and platinum heavy rain. Excellent job quantic dream team!! thanks for making it ps3 exclusive!!! I hope this game has the option for chapter select so to unlock different endings more easily. Quantic Dream is an amazing developer. Beyond FTW!!! Quantic Dream that was superb. Game looked amazing! so happy that we finally got to see Quantic Dream’s next game! This game looks like a must have. Give me a Collector’s Edition, Ross! & thanks for the post! Beyond and The Last of Us were THE BEST of the show. Amazing game!!! Looks interesting. Much more so than the Last of Us. I’m so tired of shooting people in games. Oh wow. That’s what I’m talking about. A little something different and with Heavy Rain already one of my all time faves, I’m very much looking forward to this. Glad the exclusives keep coming to PS3…so many great games coming out. Time to catch up on my back log of games! ps3 exclusives are sublime and peerless! This looks incredible! I’m really looking forward to this. WOW! This game really surprised me. I thought it would be AWESOME and have great graphics (it’s Quantic Dream were talking after all) but it I was OVERWHELMED! The story was so fascinating and intriguing even in just a few minutes and the graphics were SUPERB! Really Sony, hats off to you, you guys made one of the best E3 ever and I just can’t wait to play these games by myself. Nice to finally see the first real step into games becoming a serious art form. Can’t wait to play it! Holy snap. This looks awesome. They certainly have the emotions and facial animations on point. Great job QD! Cant wait to see more about it!! 1 Word !! AWESOME !!! BEYOND looks very interesting….Hmmmm, but this game has got me thinking. 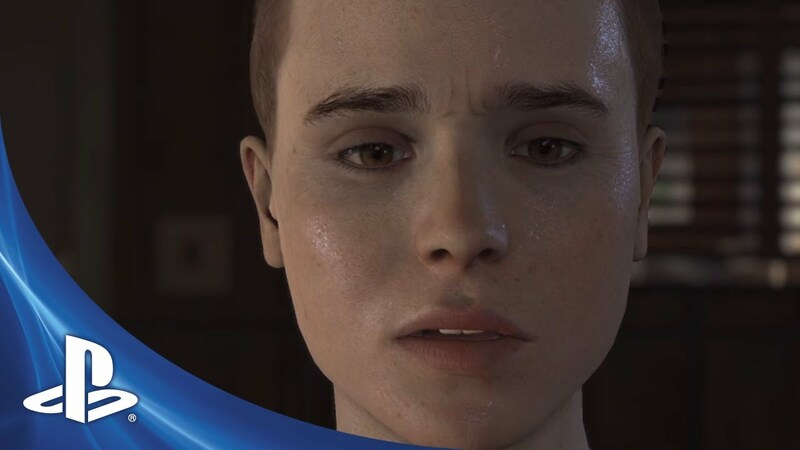 Could this be the reason Naughty Dog changed the look on the young girl in The Last Of Us because of the resemblance of Actrress Ellen Page & also the REAL Ellen Page actually starring in this game to avoid any conflict? Wow , just Wow , amazing . David Kage rocks! He has to be one of the best storytellers in the history of games. This game looks crazy, I can’t wait, it looks like it reverts back into the style of Indigo Prophecy with the slightly supernatural. omg this and the last of us is a must!!! and this is why i still own my ps3 for games like these. sorry xbox u can u have all the social network crap u have but u can never have better game than the ps3. A very interesting looking game. Heavy Rain was really a worthwhile experience and I’m sure that this one will be just as amazing. I eagerly await for it’s release. Sony, just acquire Quantic Dream!!! Do NOT let this Dev go Multi-platform!!! BEYOND is gonna be a huge game and I cant wait to see/hear more info about this title! ^I think Quantic understands that PS3 has many mature players that will be able to appreciate something unique like what they provide. I hope it’s released soon! BEYOND! Opening the show with this surprise was probably the highlight of the presentation. Except not probably, definitely. So different, so moody, so intelligent, such amazing animation. This teaser made me so hopeful as a gamer. A pre-order, for sure. Love you Quantic Dream. You guys are awesome! can’t wait to play. I love anything QD. I can’t wait to see how the gameplay is done. Quantic Dream this game looks AMAZINGGGGGGGGGGGG. along with the Last Of Us. those graphics are some of the best i ever seen, so realisticc skin and animations. that cop seemed realy nice and realy cared to help her, and i dont even like pigs. Lol . was a good highlight of the night. Game of the show for me so far. Absolutely amazing. I loved Heavy Rain and I’m sure I’m going to love this. Can’t wait. I am eager to see more of this game. Heavy Rain may have been flawed. but it’s also unlike anything else on the market. Ellen Paige is the sh!! Looking forward to actual gameplay! SHUT UP AND TAKJE MY NONEY!!! Colectors Edition Cage PLEASE ! So ready for this game! Heavy Rain had amazing graphics! Well, once again, Quantic Dream has impressed me with it’s realistic graphics and interesting story. I can’t wait to play it. And was I the only one that noticed the cops badge# was 420? Oh, the irony! This game does look fantastic for the graphics. No doubt Quantic Dream has a solid grasp on getting that right. I am wondering however if the gameplay will match? I’ve been disappointed by games in the past that looked great but sacrificed the gamer in just as engrossing interaction, Final Fantasy comes to mind a game that looks great but more time is spent watching it rather than playing it. Heavy Rain was a good game but lost out on player involvement in my opinion. I hope this game has found that perfect balance and if so… well lets just wait and believe it will.